I keep a log of all the books I read every year, and when I looked down my list at the end of last year, I noticed something. I was doing a great job reading many women writers. I was happy that I was branching out and reading a variety of books, not just YA and SF&F. But the number of POC writers on my list was low. Eight percent of my total. I did a little bit of research to find more POC writers I thought I might like, and then I did a little bit more. It was more work than I’d thought it would be, because a lot of the lists repeated the same few names over and over again, or they turned out to be about books with POC characters written by white writers, which wasn’t exactly what I was looking for. And then yesterday I was looking over my reading list so far from the year, almost three-quarters of the way in, and I realized I’m not doing enough. POC writers only account for eleven percent of my reading this year, which is only a few percent higher than years I wasn’t paying any attention at all. I decided I’d have to be more systematic if I was actually going to improve. So I spent more hours combing through the internet, looking for writers and specific books that I think I might enjoy (sometimes I can be a bit picky). I poured through lists of POC writers, I read some posts from the #weneeddiversebooks campaign from earlier this year, I peered at author photos and read their bios and interviews, and I combed my bookshelves. And I compiled a list. It is a somewhat strange list. It doesn’t include any books I’ve already read (hence the glaring omission of Octavia Butler, among others). It includes certain books because I already happen to own them. It doesn’t include certain books that I’m not interested in reading right now (this is a list that is supposed to help me read more, not discourage me from doing so). It has lots of different types of books so I can find something I want to read no matter my mood. And I’m going to keep adding to it because I know there are so many more books out there by POC writers that I’d love to read and just don’t know about yet. Here is the commitment I’m making to myself. I’ve recently joined two book clubs (yeah, I know, I don’t know what I was thinking either), so I can’t control the reading for those. And sometimes I need to read something specific for a writing project I’m working on. But aside from that, the next six books I choose to read will come from this list of works by POC writers. That should bring me to more like twenty percent for the year, given how much I expect to read. And between those six books and my book club reading, that might be about all I have time for. I’m publishing my list because I don’t think there are enough of these lists out there, and I was surprised at the amount of time it took me to compile it. I’d also love to hear about any books by POC writers that you would like to mention or recommend in the comments. 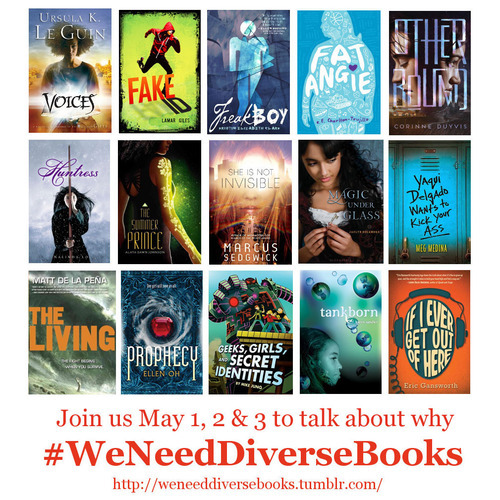 For more information on this campaign, visit weneeddiversebooks.org.